As many already know, Jennifer Rosen passed away unexpectedly. It was with deep sorrow that we stopped production of Cork Jesters Wine Teasers. We are considering options for future editions. Yay! It’s always fun to see Wine Teasers mentioned in various places on the web. Especially these days, when everyone is looking for the perfect wine stocking stuffer or gift for the wine lover on their list. And don’t forget, for mainstream media reviews and opinions, the Wine Teasers Media page has assembled a few of those! It’s a perfect stocking stuffer for wine lovers, and it’s a perfect party game for holiday get togethers! Freshly-stocked at Amazon.com, you can get Wine Teasers with free super-saver shipping, gift wrapping, and all the other “stocked by Amazon” offers. Go get it at Amazon.com’s main listing for Cork Jester’s Wine Teasers Wine Game. 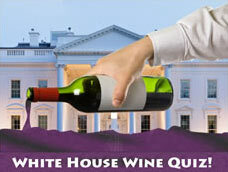 This question – plus some illuminating notes about what these four candidates are likely to drink or not drink – is part of the 10-question White House Wine Quiz, available at the Wine Teasers website or direct at http://www.wineteasers.com/whitehousewinequiz.html. The White House Wine Quiz is a lighthearted way to learn some fun facts about the role that wine plays in presidential politics and White House history. When: July 19, 2012, 6 – 9 p.m.
Where: The Wine Guyz! Best place for great wine, delicious food, and good times in La Crosse, Wisconsin, and far beyond. Why: Meet the Wine Teasers creator, drink a little wine, play a little game – who could ask for anything more? Thursday nights are game night at The Wine Guyz! On Thursday, July 19, 2012, join us for a special Wine Teasers game night at Wine Guyz! No pressure – you can play, watch, or just sip a wine and do your own thing, but decks of Wine Teasers wine game will be out and available for you and your friends (or soon-to-be friends) to use. And while you play, schmooze with Stefan Smith, Wine Teasers creator and publisher, and get the inside scoop on everything related to publishing games and playing Wine Teasers! And if it’s ready for Wine Guyz Game Night, you might get a sneak peak at a pre-publication version of the new Beer Teasers game. Wine Teasers is a social game that brings people together to talk about wine in a non-competitive environment. The rules are designed so nobody ever feels bad – even complete wine novices can participate, and with a little luck, win! So pack your crew into the Hummer (OK, so it’s a Prius) and head to The Wine Guyz for a special Wine Teasers Game Night on Thursday, July 19! See you there! Wine Teasers wine game is baaack! Hey all you wine gift buyers, head on over to Amazon.com to grab a copy of Wine Teasers wine game – we’re back in stock! Thanks for hanging in there and waiting. It was a painful few days for all you stocking stuffing elves who like to buy your wine gifts with a few days breathing room. For all you procrastinators (wear the badge with pride – we sure do) no problem! There’s still plenty of time to get Wine Teasers in plenty of time for the holidays. And remember, Wine Teasers at Amazon qualifies for free shipping (and all the other great Amazon promotions). So get ready to stuff those stockings with the best wine gift around! Sorry, Wine Teasers buyers! Our “out of stock” status at Amazon.com is ALMOST over … new games should be in stock by end of day December 1, 2011 – sold by Amazon and eligible for s free shipping and all other Amazon offers. Plenty of time to get this great wine-related gift for the wine lover on your list! If you don’t know about Wine Teasers, it’s a great wine stocking-stuffer gift! It’s wine trivia, but what we call “friendly trivia” because even beginners can play and have a chance at winning. It’s fun, educational, and certified snobbery free!